Fresh fruit is one of the best things about summer. Peaches were particularly good this year, and I just had some that were really wonderful – juicy and ripe. I just had to try these peach crisp. Typically I make apple or rhubarb crisp and peach cobber, so I thought I’d change it up with this peach crisp. It’s just as delicious as apple crisp or peach cobbler. It is so simple to make that dessert is ready in no time. Depending on how sweet your peaches are depends on how much sugar you’ll add to the fruit. Since peaches are a zero points plus food, it make this a delicious dessert. It’s sweet and hits the spot without breaking the points bank. Also, if you’re new to peeling peaches, there’s an easy way to do it. Just dunk the peaches in boiling water for about 30-45 seconds then submerge in ice water. The skins should just slide right off. It helps make this a perfect recipe for a quick and easy dessert. This dessert is incredibly tasty and satisfies the sweet tooth without being too rich. The sweet and juice peaches are a perfect base that don’t need a lot of sugar. The crisp topping is quick and easy to make. 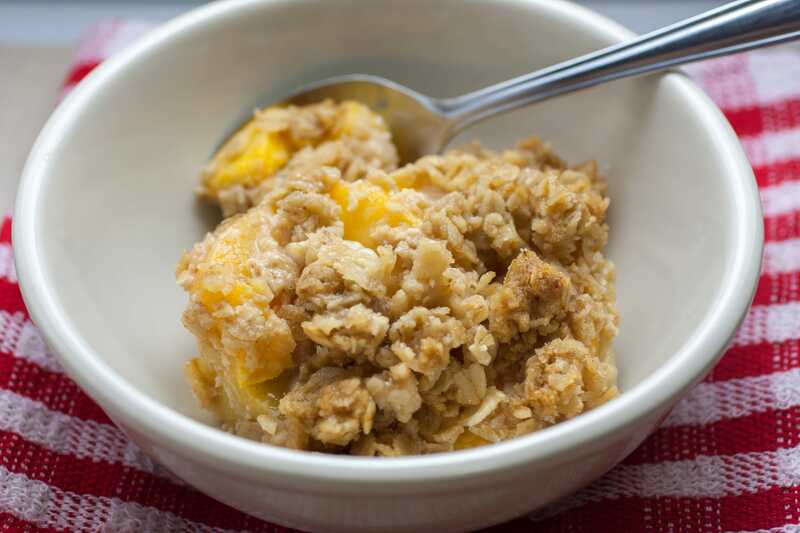 You’ll love this peach crisp the first time you try it. Combine the cinnamon, nutmeg, biscuit mix, brown sugar and oats. Mix until well combined. Add the softened butter and mix until uniform. Set aside. Peel and slice the peaches and place in a large bowl. Combine the sugar and cornstarch in a small bowl. Add the sugar mixture and lemon juice to the peaches. Mix well. Spread the peaches in the bottom of a 9×13 inch baking dish. Bake for 60 minutes, or until the topping is golden brown.